Located in a quiet neighborhood just 10 minutes from the center of Grenoble, our hotel is a cozy cocoon. 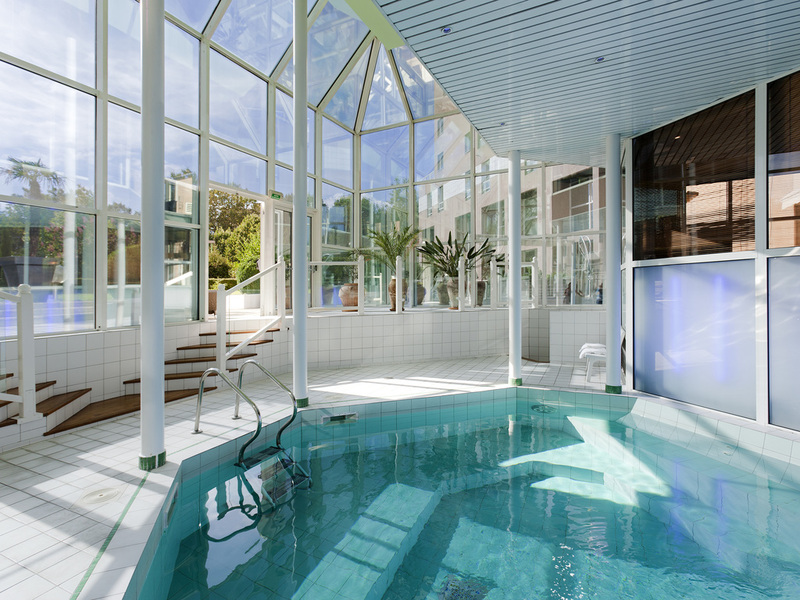 Relax in the sauna, swimming pool and fitness center, or in one of the rooms. Our restaurant and bar offer a touch of creativity. In the middle of town and close to the tram, Mercure Grenoble Président is an ideal starting point to combine pleasure and work during your business trips. In the region, discover the Chartreuse and Vercors mountains. Our restaurant will be closed at lunchtimes from July 23 to August 19, 2018. It will remain open in the evenings from Monday to Friday. For your comfort, choose from our range of rooms, which have been entirely redecorated in a modern style: Standard Rooms, Privilege Rooms offering a wide range of services or spacious Junior Suites. The restaurant L'instant M offers an invitation to the tasting pleasure of a traditional and pleasant cuisine. Our restaurant will be closed at noon from December 22nd 2018 to January 6th 2019. Nice clean rooms. Quiet. Good bar area. Not really had time to experience what hotel offers. Very short stay. Generally the hotel was good. Clean, nice atmosphere, friendly staff. Just add veggies to breakfasts, please. It was nice to stay with you, ve=ry friendly and professional staff. The only thing I missed was some vegetables for breakfast, please. Room was always cleaned up, deodorized and very comfortable. I enjoyed very much. TV channel were variously, local and international line. Always smiles and hospitality officer whenever I met. Good food & beverages on breakfast and dinner. Free and excellent connected wi-fi. my experience meet all of my expectations. The room was very clean, and service was outstanding. The resturant food was outstanding as well as the front desk service. Pleasant and helpful staff, nice room and a very good restaurant. I really enjoyed my stay. The staff at the front desk was very helpful and the hotel restaurant food was very good. Really appreciate everything at this hotel. Good and relaxing stay during the business trip. Great experience, clean room, nice and supportive personnel, great restaurant - both service and food. The check-in process was easy and the staff accomodating. As a Gold Le Club Accor member I did not even have to ask and had been upgraded to the Privilege Suite. The breakfast was nice though not exceptional but the hotel was happy for me to have guests (a per person cost was just added to my bill). I slept soundly in the Mercure bed and took advantage of having a free mini-bar. I was a little disappointed that the hotel was now charging for parking as I seem to recall that parking was free when stayed at the hotel previously. Overall, a good experience and the staff professional and accomodating. I would like to thank the receptionists who worked on the night sat 3rd Feb. Our flight home was cancelled and I had my 4 year old son with me and it was a very stressful situation. They were incredibly helpful and friendly. They are a credit to the hotel and hope that this email gets passed onto them. nice greeting on arrival. Room had comfortable bed, good shower. bar & restaurant ok. I stayed in the hotel for 4 nights. The bed was very comfortable. On my last morning, the shower leaked, which made all of my stuff that was on the floor (like my whole cotton toilet bag) soaking wet. Furthermore, the gym was a lot smaller in real life, than it looked like on the pictures.